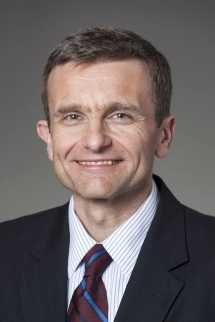 Indiana University President Michael A. McRobbie and Indiana University-Purdue University Indianapolis Chancellor and IU Executive Vice President Charles R. Bantz have announced the appointment of Amir Pasic as the dean of the IU Lilly Family School of Philanthropy. Pasic’s appointment is subject to approval by the IU Board of Trustees and he is expected to begin his new position on Jan. 20, 2015. Lilly Family School Founding Dean Gene Tempel will continue to lead the school until Pasic’s arrival. Pasic is currently vice president for international operations with the Council for Advancement and Support of Education, a global professional association serving educational institutions and their advancement professionals responsible for alumni relations, fundraising, communications, marketing and allied areas. As the second dean of the school, Pasic will assume leadership of the world's first school devoted to the study and teaching of philanthropy. The IU Lilly Family School of Philanthropy is dedicated to improving philanthropy to benefit the world by training and empowering students and professionals to be innovators and leaders who create positive and lasting change. The school is an internationally recognized leader in philanthropy education, research and training. "Amir has the wide range of experiences, skills and global connections that are just perfect for the next leader of the world's first school of philanthropy," Chancellor Bantz said. "His extensive experience dovetails with the school’s mission of improving philanthropy to benefit the world. And his expertise in strategic planning and development demonstrated by his achievements in his current role at CASE, along with his academic prowess in leadership roles at Johns Hopkins are indicative of a strong commitment to and passion for the advancement of philanthropy. Amir’s appointment ensures the Lilly Family School of Philanthropy's future is in good hands." The IU Lilly Family School of Philanthropy offers bachelor, master and doctorate level degrees in philanthropic studies. Groundbreaking research conducted by faculty and staff helps nonprofit organizations and donors accomplish their important missions more effectively. The school, with an endowment of more than $80 million, provides a comprehensive approach to philanthropy through its academic, research and international programs and through The Fund Raising School, Lake Institute on Faith & Giving and the Women’s Philanthropy Institute. Pasic brings a wealth of exceptional experience and expertise in philanthropy and higher education leadership, including serving as university development leader, a foundation officer at the Rockefeller Brothers Fund and a faculty member at Brown University in addition to his senior leadership role at CASE. As CASE vice president since Dec. 2011, Pasic has been responsible for leading the growth of the organization's operations in Europe, Asia-Pacific, Latin American and Africa. Under his leadership, CASE's international annual revenue has experienced double digit growth, while its overseas memberships and conference attendance are at record levels. Prior to joining CASE, Pasic served as associate dean for development and strategic planning for the Paul H. Nitze School of Advanced International Studies at Johns Hopkins University, where he also served as executive director of the Foreign Policy Institute. During his time as dean, the school exceeded its $120 million goal as part of the university’s $3.7 billion Knowledge for the World Campaign. As executive director, he crafted seminars and simulations; oversaw the nomination and approval of fellows; hosted academic and policy leaders; and mentored student journal editors. Before Johns Hopkins, he also served as deputy vice president of advancement at George Washington University. AGB Search assisted in the national search for the school's new dean. Andrew Klein, dean of the IU Robert H. McKinney School of Law in Indianapolis, also located on the IUPUI campus, chaired the university search committee. "Amir is no stranger to the academic community, and his international ties and demonstrated expertise in strategic planning and development make him a perfect choice for the new dean," Klein said. Pasic earned his doctorate in political science at the University of Pennsylvania. He holds a master's degree in international relations from Johns Hopkins University and a bachelor's degree in economics and political science from Yale University. Born in Iran to parents from Croatia and Bosnia, he also speaks German, French and conversational Farsi. "Amir's remarkable background and qualities have prepared him well to lead the Lilly Family School of Philanthropy," Tempel said. "With his diverse range of experience from the classroom to the development office to the national and international perspectives he has had at CASE, Amir brings both a breadth and depth of understanding and new ideas to build on the foundation that we have laid and to develop the next phase of the school. Like my colleagues, I look forward to assisting him in developing the school to its full potential."